On Tuesday I was lucky enough to attend the #140 conference in London which was launched under the banner of Exploring the state of Now. There have already been two excellent blog postings by Terry Freedman and Chris from BrainPop but I want to record some of my thoughts around the event. I won my ticket after responding to a tweet by organiser Jeff Pulver @jeffpulver explaining why I wanted to attend. My hope was that I would see how people working in other businesses and areas of public sector are using twitter. This was to see if I could gain ideas for in-school work, my personal use of Twitter and also in my role working for the National Strategies. I arrived early at the O2 arena and made my way to Indigo not sure whether, other than @digitalmaverick, I would know anyone. Within minutes the power of twitter became clear as I found that @neiladam was actually sat two seats to my right and @terryfreedmanwas on the other side of the room with @billgibbon. The day was launched by @jeffpulver who set the tone for the day with the key message for the day of “Listen connect share and engage”. The first hour was a very upbeat and touchy-feely presentation of presentation of the benefits of Twitter with ’twillionaire’ @stephenfry following later. It is also, he opined, the future of communications enabling us to live in the state of now – this is the fact that there is so much more immediacy to the sharing of facts, news, information and opinion. He then introduced the issue of authenticity for the first time during the day arfuing that we could see the rise of consumer to consumer marketing (as people trust the views of a friend significantly more than those of a corporate). This did spark a thought in my mind as to whether there were any implications for education on a local scale from this comment. He stressed how Twitter users recognise authentic and phoney users from politicians, multinationals etc. This is a theme which I will return to later in the post. He talked about the opportunities provided to develop serendipity through developed engagement and also links. The example he gave was of the fans and stars of a TV show being able to communicate without the control or interference of PR consultants. Before Stephen Fry came on we saw a discussion between Babs Rangaiah Vice President, Global Comms Planning, Unilever and his colleague Laura Klauberg Vice President, Global Media, Unilever comparing the attitude of a Twitter addict and someone who doesn’t necessarily see its point. It is very to be cynical but part of me wondered why two extremely highly paid executives would give up their time to speak for ten minutes at such a conference if there wasn’t some cross benefit for them. This jarred with the idea of authenticity of which Jeff Pulver had been talking so enthusiastically. Babs Rangaiah made some pertinent points which may have implications for education. He accepted that Twitter would be transient and was not necessarily here to stay but “real time recording of the present is here to stay” this is something which not enough school leadership team see; too many remain caught up in previous approaches or ignoring new developments as they will simply be a phase. He also commented that Unilever marketers are encouraged to live the space which again struck a chord with primary education in terms of understanding children’s use of technology. 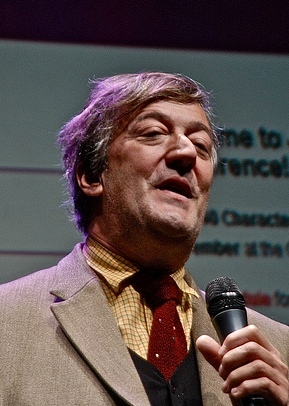 Stephen Fry was then welcomed to the stage to talk about the the cult of the celebrity twitterer. A year ago virtually no-one knew about Twitter and shows the massive change that comes through the internet. He said that the the point which is missed by too many is the emotional relationship of users with their technology. Brands are in danger of forgetting they need to talk to people as people, not as a business. So again we returned to the authenticity argument. He was interesting when talking about the ‘deadwood press’ citing how journalists have changed their view of twitter a year ago – especially the commentating class of journalist. They have undertaken a complete volte face starting their own stream, having initially initially derided any fatuous celebrity who dared to have a twitter account. omoters of a thread and used twitter as their source of information. I did like his analogy of Twitter as a city with churches, red light zones, slums, beautiful areas etc and is influenced by its citizens. These things are human shaped don’t deny the internet your voice. Andrew Keen Author, Cult of The Amateur: How the Internet is Killing our Culture then took to the stage to give the dissenting voice. He was excellent in his attempt to politely pop the balloon of loveliness and potentially naivety. Keen’s arguments were that the illusion of the state of now is that the world is flattened and we are rediscovering humanity whereas what we are actually rediscovering is power. The real word to discuss is authenticity – the human quality of being able to intimately engage. The more authentic one appears on Twitter the more power you have and the more you can connect. We are looking at a profound historical shift from the power of the press (based upon old structures) to a more authentic approach. The danger of this that we haven’t explored is what happens when someone who appears to be authentic is a charlatan. Stephen Fry has the power to rubbish papers, writers etc through his following. As the world is one in economic crisis we have a state of now which could lead to catastrophe- this depends on who is peddling the truth as we have now done away with fact checkers, editors etc. His analogy was that we now approach ‘digital vertigo’. Those of us in the know in the state of now cannot allow ourselves to be deluded that this is going to be a state of utopia. The key message I took from his session with implications for my role was that one third of people get Twitter right away, one third people get it eventually and one third won’t ever. He argued that this was the same for companies. The questions I posed myself were What would this be for Primary education? and What would this be for other applications around web 2.0? I won’t repeat the detailed descriptions of the day repeated elsewhere especially as we then saw a range of speakers who showed how Twitter could be used to support their work. This included corporates looking at how they could exploit it – this seemed to run counter to the arugument that Twitter is an authentic medium. There seemed to be a great dichotomy between the first hour and then corporate nature of this part including the discussion of Twitter and music. I also felt very old when Eminem (who first made it big in the US in 1999) was described coming from an age when…! I was taken by the description of their policing of the EDL march in Birmingham and how they used Twitter to get information out on to the streets with great immediacy. One example was countering rumours spreading around one event. Ultimately James Clay is correct in arguing that too many institutions were blocking social media and that twitter was the present favourite toy but I also felt that was missing the point that in education the medium is often irrelevant – those schools which are using Twitter will not stick it with ad infinitum but the change in their practice is what will remain and what is more significant. The examples I think of are classes like @globalrams, @classroomtweets and @giraffeclass who are communicating with each other and other classes. They are also infant classes which are using the immediacy as a motivational tool for encouraging children to apply their phonic knowledge. The teachers are tackling the thorny issue of e-safety sensilby rather than over-emotively or through a paranoid lens. They will move on from Twitter maybe to applications we haven’t thought of or to something which other classes are using but the experience will change the way that those teachers operate. So to echo other blog posts – was attending #140conf worthwhile? Yes, definitely because it allowed me to do what I had stated in my original tweet to Jeff Pulver. I had a day considering how educationalists could develop their use of social media. I have revisited my thoughts on the use of Thomas Guskey‘s model of evaluation of CPD (See previous blog post) and have started building models around the implementation of twitter and other applications.